The world whirls out of control in Shakespeare’s thrilling tale of France’s Joan of Arc, the English warrior Talbot, and the young king Henry. 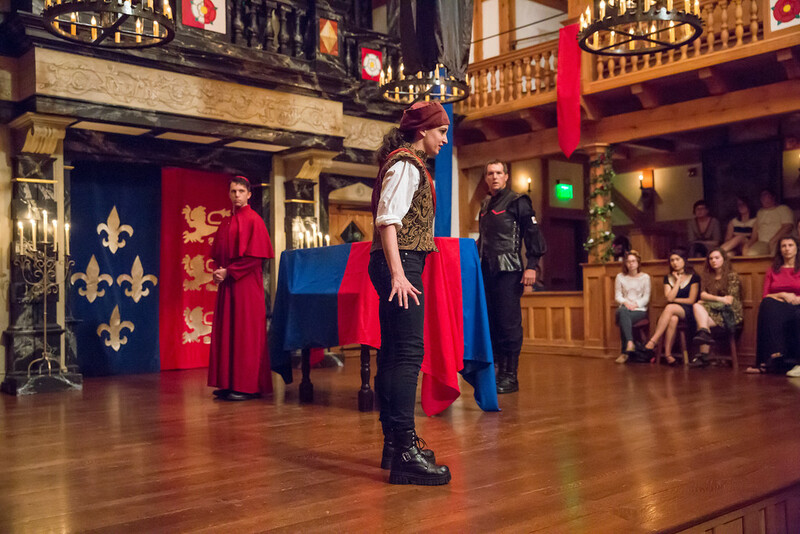 From the funeral of Henry V that opens the play to Joan’s fiery execution, Shakespeare’s brilliant first installment of the Wars of the Roses is riveting storytelling that never lets up. 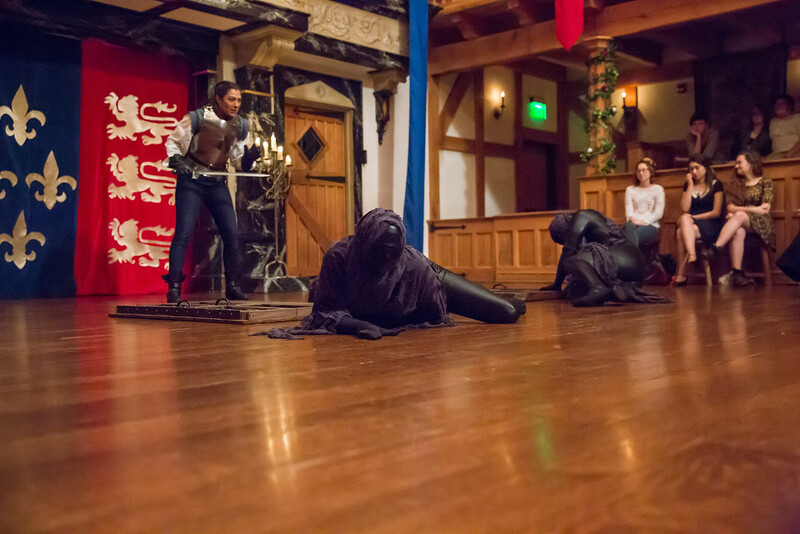 Gregory Jon Phelps, Stephanie Holladay Earl, and John Harrell in SHAKESPEARE'S JOAN OF ARC. Photo by TOMMY THOMPSON. 2015. Abbi Hawk and Chris Johnston in SHAKESPEARE'S JOAN OF ARC. Photo by TOMMY THOMPSON. 2015. Abbi Hawk and James Keegan in SHAKESPEARE'S JOAN OF ARC. Photo by TOMMY THOMPSON. 2015. Patrick Midgley in SHAKESPEARE'S JOAN OF ARC. Photo by TOMMY THOMPSON. 2015. John Harrell in SHAKESPEARE'S JOAN OF ARC. Photo by TOMMY THOMPSON. 2015. 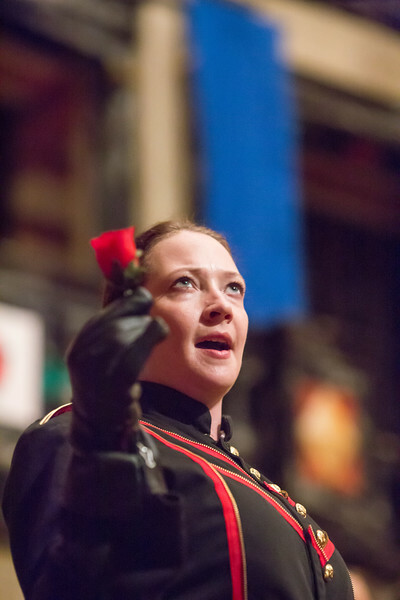 Sarah Fallon in SHAKESPEARE'S JOAN OF ARC. Photo by TOMMY THOMPSON. 2015. Stephanie Holladay Earl in SHAKESPEARE'S JOAN OF ARC. Photo by TOMMY THOMPSON. 2015. 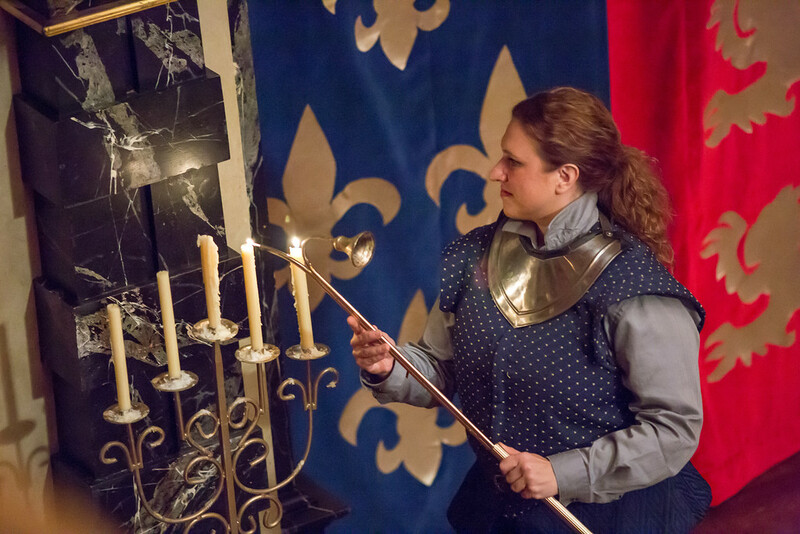 Allison Glenzer in SHAKESPEARE'S JOAN OF ARC. Photo by TOMMY THOMPSON. 2015. Abbi Hawk and the cast of SHAKESPEARE'S JOAN OF ARC. Photo by TOMMY THOMPSON. 2015. 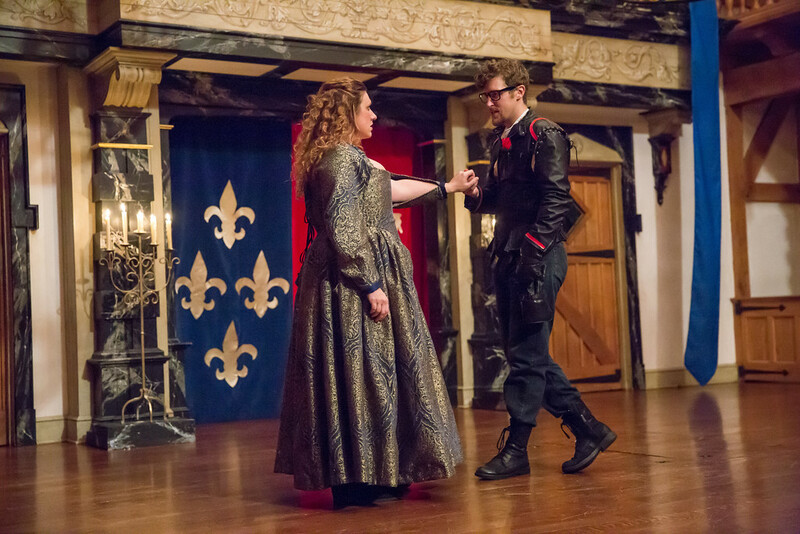 Allison Glenzer and Patrick Earl in SHAKESPEARE'S JOAN OF ARC. Photo by TOMMY THOMPSON. 2015. Shakespeare’s The Life of King Henry the Fifth (playing at the Blackfriars in 2015/16). King Henry the Fifth of England wins the battle of Agincourt, accepts the surrender of France, marries the French King’s daughter, and the two of them have a son. While mourning the untimely death of Henry the Fifth, the royal family learns of widespread French victories against the English forces. At the Tower of London, the Duke of Gloucester, young King Henry the Sixth’s protector, fights with his uncle, the Bishop of Winchester. Joan meets Talbot, the great English warrior, on the battlefield. 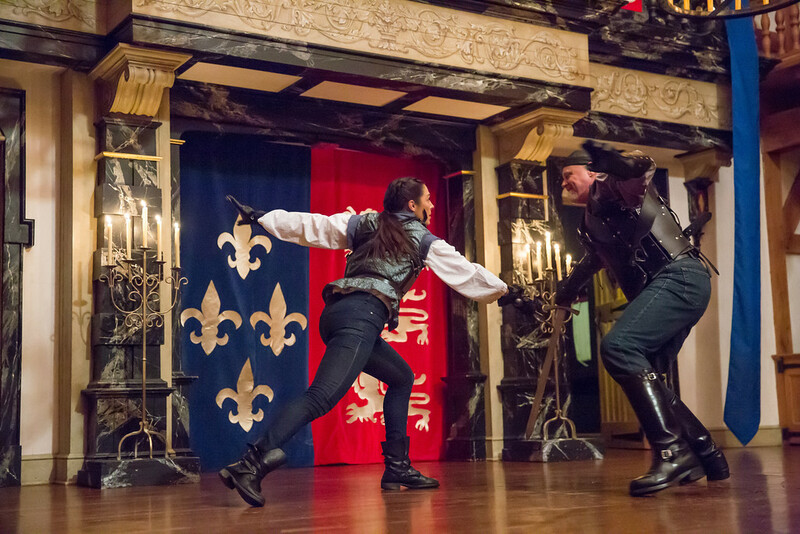 They fight, but Joan tells Talbot that his “hour is not yet come.” Talbot takes Orleans. 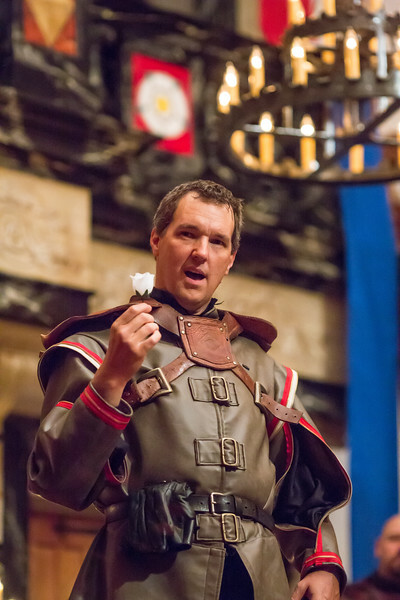 In London, lords of the houses of York (white rose) and Lancaster (red rose) symbolically pluck their roses, setting the stage for the brutal Wars of the Roses to come. On his deathbed, Edmund Mortimer declares his nephew, Richard Plantagenet, to be the rightful heir to the throne of England. King Henry worries about England’s internal conflicts and names Richard Plantagenet as Duke of York. In Paris, Henry is named King of France and orders Talbot to march on the French. Outside Bordeaux, Talbot learns that the French approach with 10,000 men. Shakespeare’s three plays that cover the reign of King Henry the Sixth have not gotten the love they deserve over the years. Maybe the reason is because some scholars believe 1H6 was co-authored by Thomas Nashe (and/or others). Perhaps it’s because some scholars believe 2H6 and 3H6 were written first and then Shakespeare wrote 1H6 as a prequel. Or maybe some elitist folks are just snobbish about the “baseness” in the high number of fights, skirmishes, and broad battle scenes that seem to be inspired by the box office blockbuster Tamburlaine the Great by Christopher Marlowe. Whatever the criticisms may be, our mission with this production is to entertain your socks off with the beginning of Shakespeare’s King Henry the Sixth trilogy. Call it a new hope. Some analyses of sixteenth century records say that 1H6 was a box office hit in 1592. But performances of 1H6 as a stand-alone play have been somewhat scarce ever since. Centuries after its first performances, conflations became king as theatres thought the only way to tell the H6 story was to reduce the three plays down to two. 1H6 has often been diminished to bits and pieces mashed-up with parts of 2H6 to create one play while the second half of 2H6 has been combined with a truncated 3H6 to create a second mash-up. Some of the more famous conflations over the years have even eliminated Joan of Arc and Talbot in order to take the three plays down to two. WHAT?! It’s like saying “I like the Beatles, but their catalogue is too large, so we’re going to remove all the John Lennon songs.” Or “I like the three original Star Wars films, but they’ve got too much material in them to be popular; so let’s cut out Han and Chewie so we can slice them down to be only two movies.” WHAT?! Our production of Shakespeare’s Joan of Arc (Henry VI, Part 1) gives you all the great stuff Shakespeare (and whomever) put in it: the end of the 100 Years War between England and France, with all the fights and skirmishes, and deaths; the story of the mighty Talbot; the story of the amazing Joan; the start of the story of young King Henry; the introduction of the fabulous and deadly Margaret; and setting the stage for the white vs. the red Wars of the Roses. Maybe we’re on the cutting edge by going back to the text (like we are going back to the future re-creating Shakespeare’s staging conditions) rather than “helping poor Shakespeare” by cutting and pasting his three Henry VI plays and hanging some kind of “new concept” on them. Hopefully you love Shakespeare’s Joan of Arc this fall so much that you’ll brag about it to your friends and family so they’ll see it too. 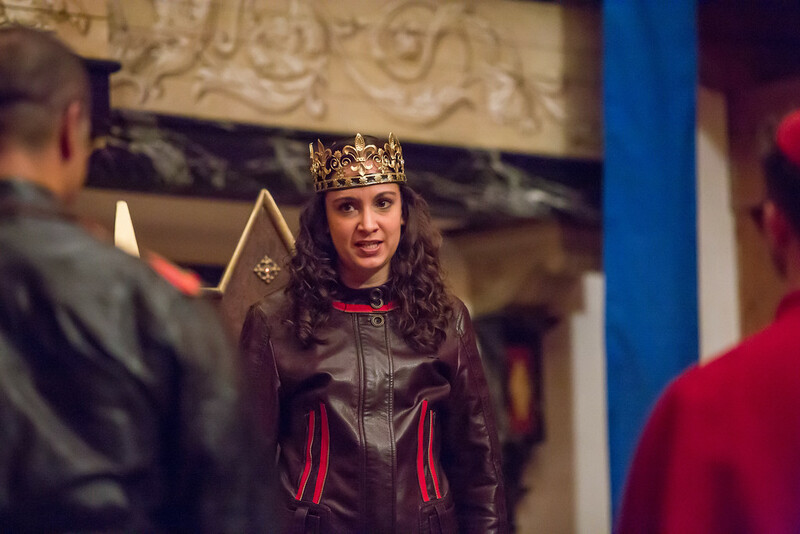 And then all of you can join us in 2016 for The Rise of Queen Margaret (Henry VI, Part 2). With a new Star Wars trio of films coming soon, we invite you to join us for the opening installment of Shakespeare’s original trilogy first.